Abigail Rabenstein and Alex Steiner (pictured) received scholarships from the Southwest District Athletic Board. DAYTON – The Southwest District Athletic Board hosted the 22nd Annual Scholar-Athlete Reception on June 23 at the Dayton Marriott Hotel. Forty-one scholar-athletes, along with their family and school administrators, enjoyed a dinner and awards program. Pat McBride, Board President, welcomed the guests and presented the awards, along with board members and Steve Neil, from the OHSAA State Office. Since 1993, the OHSAA has awarded scholarships to some of the state’s top senior scholar-athletes. 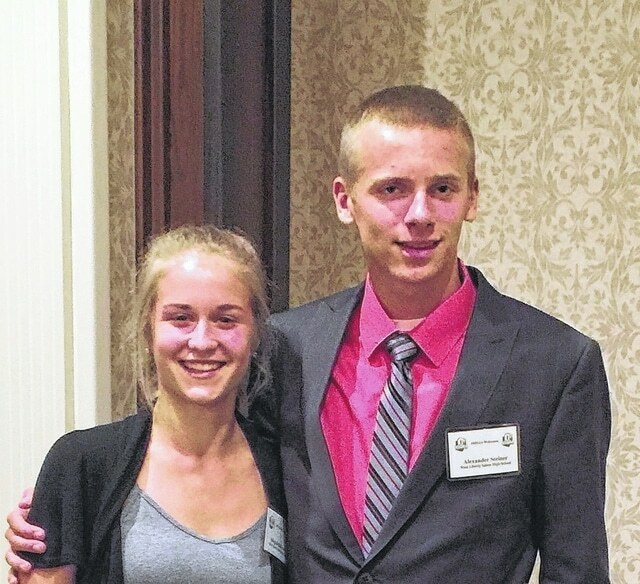 This year, two members of the West Liberty-Salem Class of 2015 received scholarships of $1,000 each. Abigail Rabenstein is the daughter of Steve and Sandy Rabenstein. During high school, she participated in soccer and track and field and plans to attend Clark State Community College and major in dental hygiene. Alex Steiner is the son of Doug and Ellen Steiner. He participated in both cross country and track and field at West Liberty-Salem and plans to attend Goshen College and major in biochemistry and physics.